Just a little about myself this week to put you in the picture. I have been diagnosed with lung cancer and. at the same time, have found a wonderful new partner called Francis, a Professor of Social Psychology. He is also a widower who nursed his wife through dementia, and is prepared to look after me through my obviously difficult times ahead. 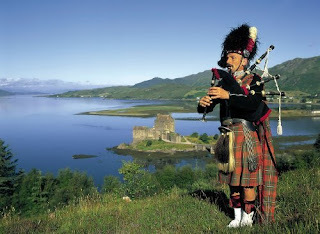 I put the picture of the piper on the blog as Francis plays the bagpipe and did so for me, by a lake, in the Forest of Dean this last lovely sunny week. So good and bad news but I am determined to fight whatever comes up and to get through the eye of the storm. The blog will continue as usual next week. The RSPB has given gulls a better press than they have been having lately. Apparently they are intelligent and adaptable and we should learn to understand them. 'Clever gulls have learned that humans can be messy, leaving discarded food on the streets or in overflowing litter bins, and also that sometimes we will feed them' said a spokesperson for the RSPB. Gulls are skilled scavengers, however they have a soft side and mate for life. The male helps incubate the eggs, then later takes it in turn with the female to look after and feed the chicks. Obviously the modern male, then! So glad to hear your good news, and wonderful to know you have support through the bad. Always thinking of you.